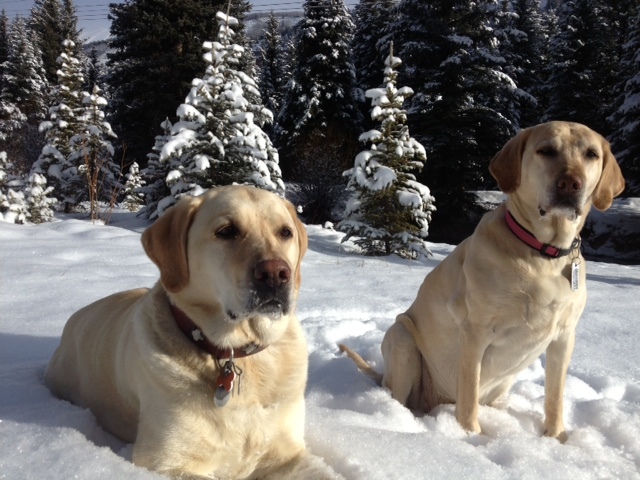 Telluride Veterinary Clinic | Visiting with your dog? Most healthy dogs do very well with the altitude. Taking it easy the first few days and making sure water is available can help. If you think your animal is getting dehydrated mixing lots of warm water with meals can help and some dogs like Pedialyte. Low salt chicken or beef broth can help but make sure it is low salt. The altitude can ‘uncover’ hidden heart or lung issues due to the lower availability of oxygen and moisture in the air. Watch for anxiety, panting, purple, blue or pale gums, trouble breathing, restlessness, coughing, inability to settle down and sleep. We have several emergency evacuations a year to lower altitude. It can also exacerbate other conditions. It may be better for your older companion to remain at home. We do have Giardia here, it usually manifests as diarrhea and maybe vomiting. Usually it is easily treated. And we have porcupines! Lots of porcupines. If there are only a few quills a pair of needle nose pliers can be very useful. And, despite, what it may say on the web, cutting the ends off only makes them harder to get out. If there are more than 10 or 15 the kindest thing to do is come in and let us anesthetize the dog and then remove them. There are no boarding kennels for dogs in Telluride. The closest ones would be in Norwood, Montrose or Cortez. There are some good dog sitters here, availability varies, call early for best chance of finding one free. The clinic has a very limited number of spaces for medical observation during the day. (830am to 530pm).